Josh Rosenstein is an Israeli-American farmer, chef, writer, Permaculturalist and entrepreneur. An Evergreen State College grad, he has over twenty years’ experience working with plants: from retail nurseries and landscaping crews to agriculture of every stripe. Before founding Edible Eden, he worked as a writer in the Pacific NW, served as staff at The Adamah Farming fellowship in Connecticut and served as farm director at the Pearlstone Center in Reisterstown, MD. 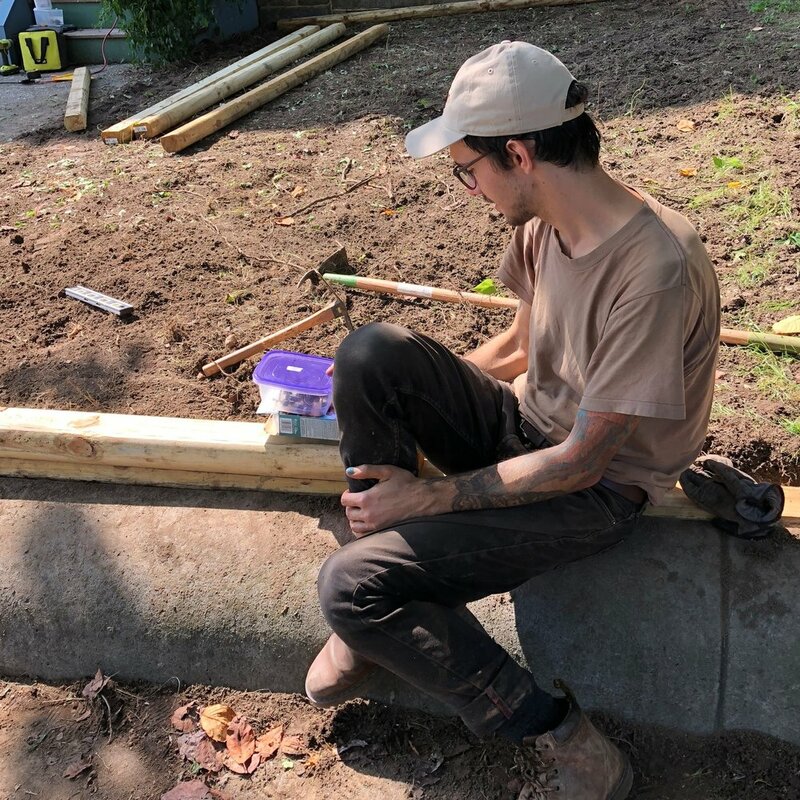 Equipped with a lifelong passion for ethical eating and farm-to-table cooking, Josh delights in the magic of turning seeds, soil and sunshine into delicious things to eat and inspiring and supporting people to connect to their food source. Teri Jedeikin, MSW is a dynamic educator, therapist and creative designer. She supports Edible Eden through illustrating our design maps, teaching workshops and taking care of CTO Malakai Wolf. Originally from South Africa, Teri has degrees in theater design, anthropology and social work. She is passionate about compost, worm bins, medicinal herbs and home made body care products. Brody, our Operations Manager and Farmer, joined the team in 2019. With a background in farming, permaculture design and Ethnobotany, he will be active in the field developing and maintaining your foodscapes. He has a passion for the diversity of life from trees to fungi and can be found foraging in the forest floor or climbing through the canopy. Claire’s love of food, gardening, and plants has grown during her time as an urban farm intern, farmers market manager, after-school cooking class instructor, and Baltimore City Master Gardener Intern. She is excited to foster relationships with the land and with food while creating productive and life-supporting green spaces in and around Baltimore. Tony enjoys slow mornings and eating mustard greens during the late summer afternoons. They are passionate about access to nutritious food that nourishes both the body and the mind. As an accomplished builder, Tony would love to create the garden of your dreams. Malakai joined the team just over 2 years ago, when he was born. Since then, his greatest contributions have been guaranteeing produce freshness and limiting food waste with his big appetite. Without a doubt, he contributes the most to the team, with his dashing good looks and refined tastes. Minka the garden dog loves to eat our produce... and anything else she can get her paws on! Sign up to get coupons, garden tips & garden-to-table recipes from Edible Eden Foodscapes.